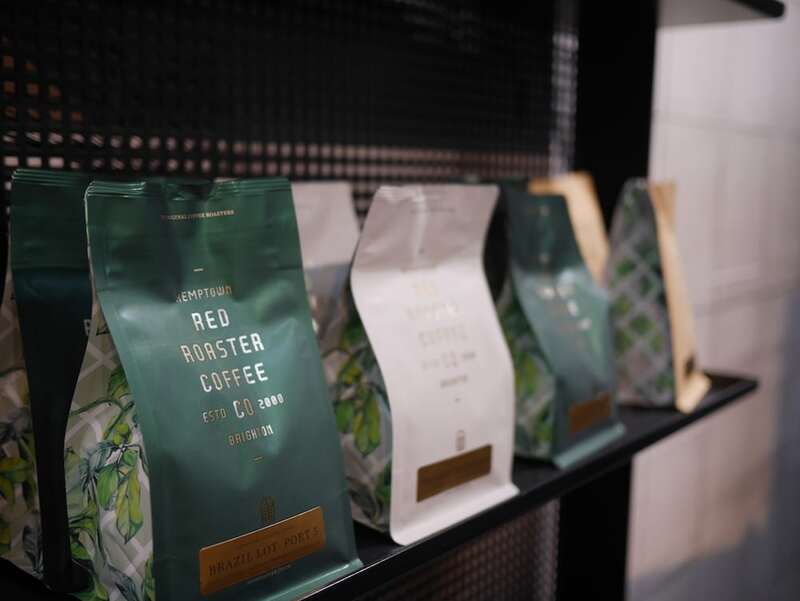 Red Roaster opened back in 2000, long before coffee shops became trendy hipster hangouts. Almost twenty years later, it’s evolved from a local coffee shop to a world-class café and restaurant, serving contemporary cuisine and cocktails alongside its hand-roasted coffee. 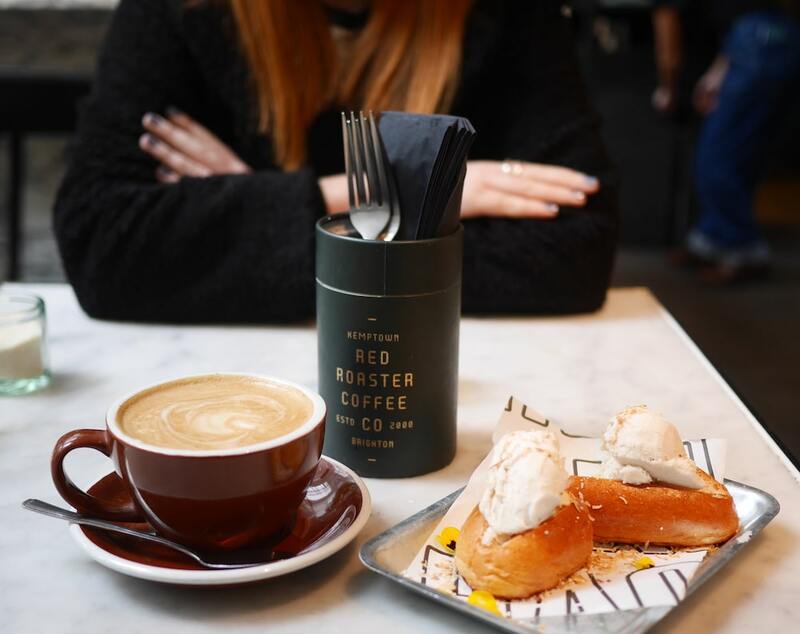 By day, Red Roaster Café offers brunches, lunches, coffees and cakes. 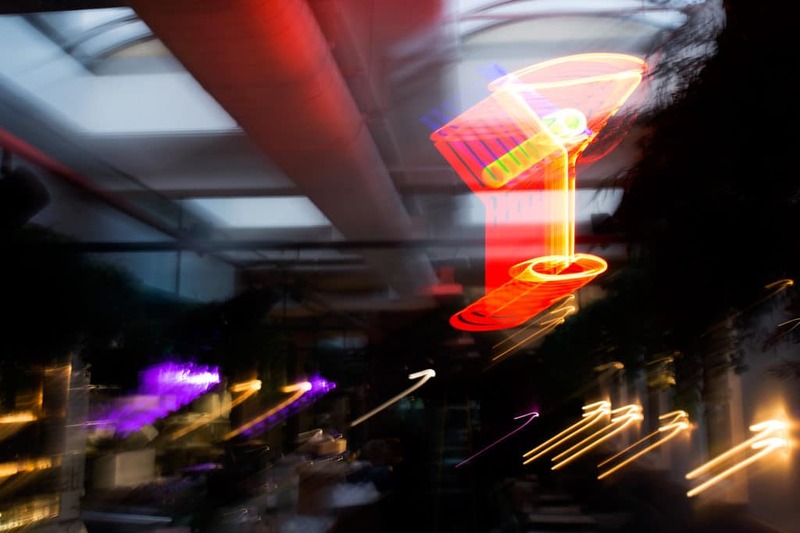 After 5pm, it switches on its neon light and transforms into Lucky Khao – a funky Northern Thai BBQ restaurant. 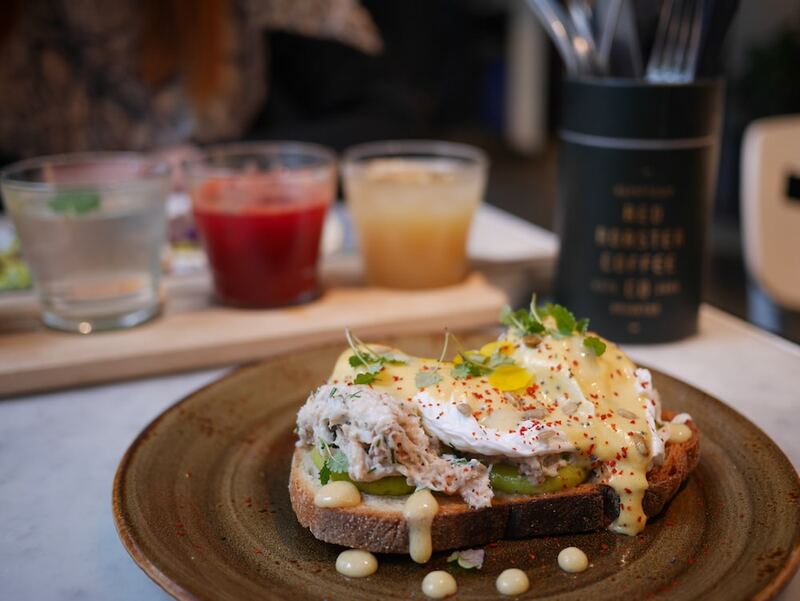 Visiting on a Saturday morning, I went along to check out the brunch menu with my friend Ella – a long-time Brighton resident who has been a fan of Red Roaster since its early days. 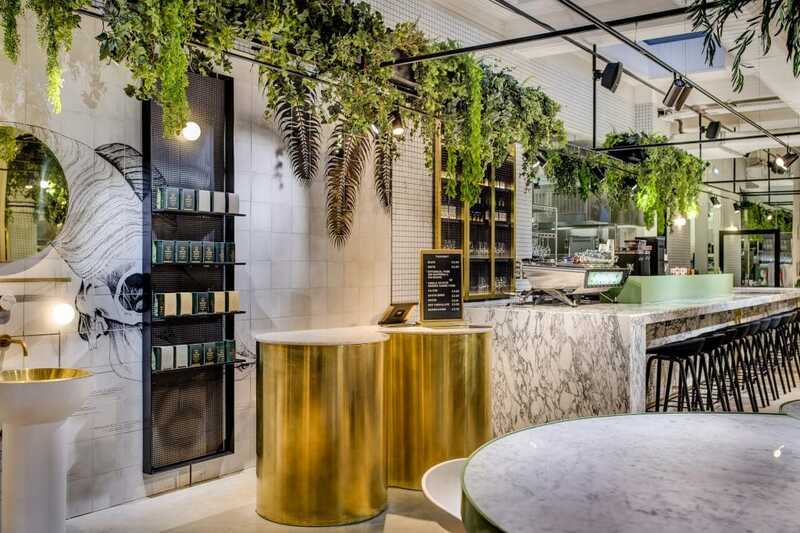 Unlike anywhere else in Brighton, Red Roaster’s interior is the vision of World Restaurant Designer of the Year 2015/16, Hana Hakim. Laidback yet luxurious, this glasshouse-style space is flooded with natural light and finished with fresh foliage. Luxury touches like the long marble bar area make it feel special, and there’s an open kitchen where you can watch the talented team at work. The all-day brunch menu offers everything from a Full English, to blueberry pancakes and Shakshuka. 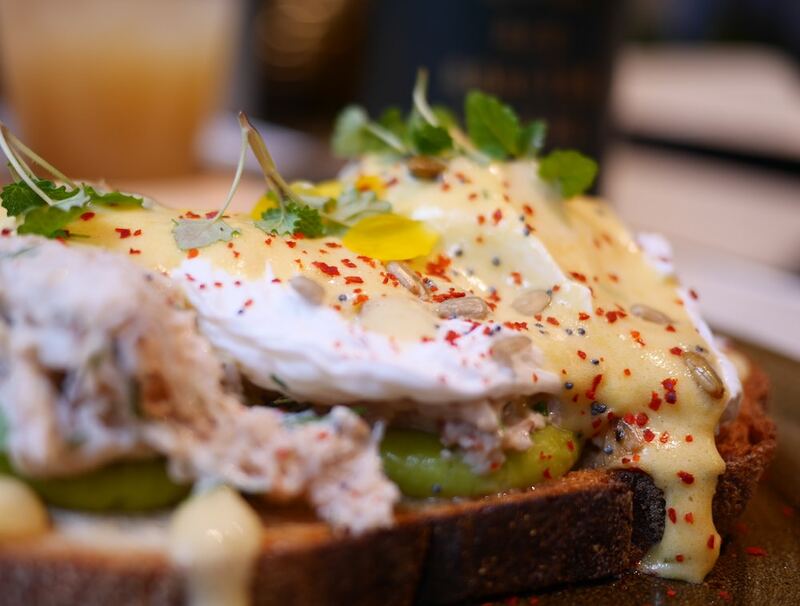 Classics like eggs benedict are elevated with confit pork shoulder and cider glaze, and the avocado toast comes with candied beetroot. 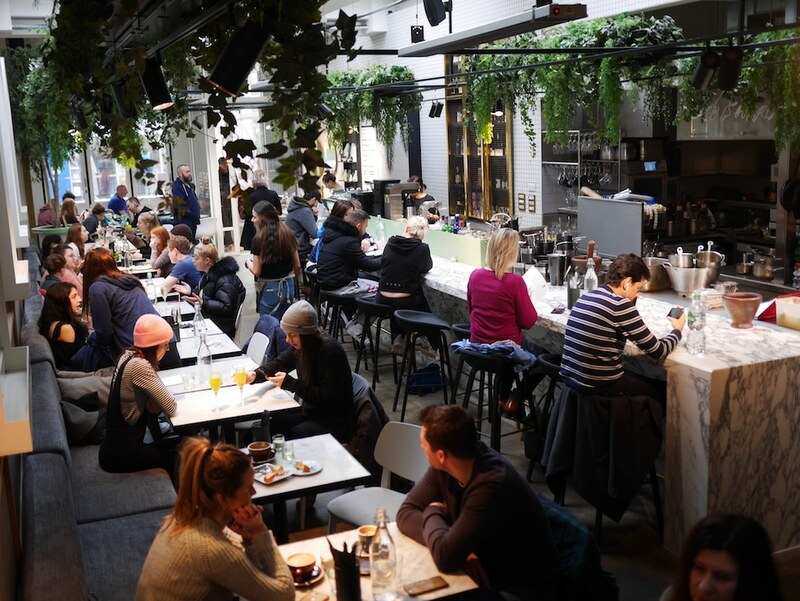 If you fancy something more lunchy than brunchy, you can choose from the likes of chard green wraps with roasted aubergine and papaya slaw; or the vegan ‘Impossible Burger’ with miso onions and cheese fondu. 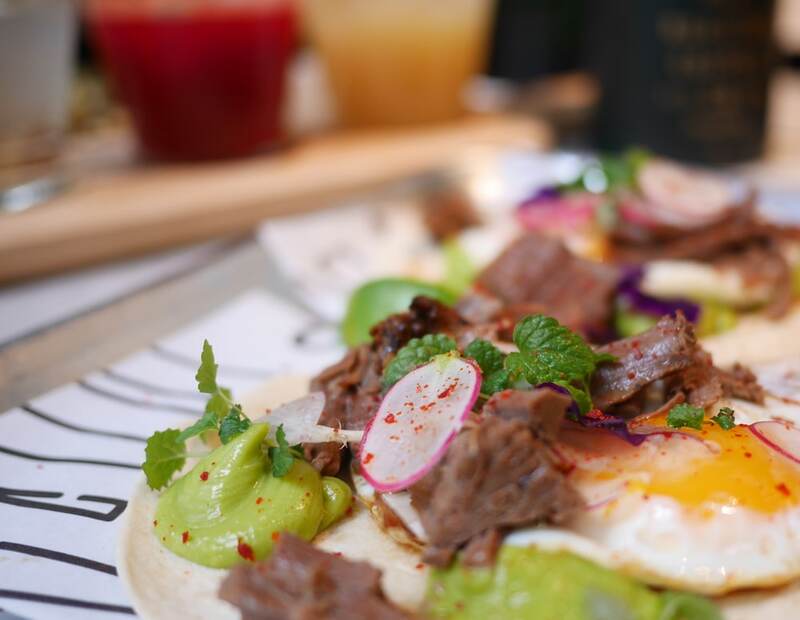 For brunch, you can order individual items from the menu, or go all out with the weekend Bottomless Brunch, which includes 90-minutes of unlimited cocktails. Determined to have a healthy weekend, Ella and I reluctantly gave the cocktails a miss, resisting the lure of Bloody Marys, botanical mojitos with basil cordial, and pink G&Ts with strawberry syrup. Instead, we perused the extensive menu of Red Roaster coffees, wellness lattes and fresh juices. After considering everything from hibiscus tea to coconut cardamom chai and good old PG tips, I opted for the Immune Rocket – a wake-me-up-call of lemon, fresh ginger, chilli agave and cayenne pepper. 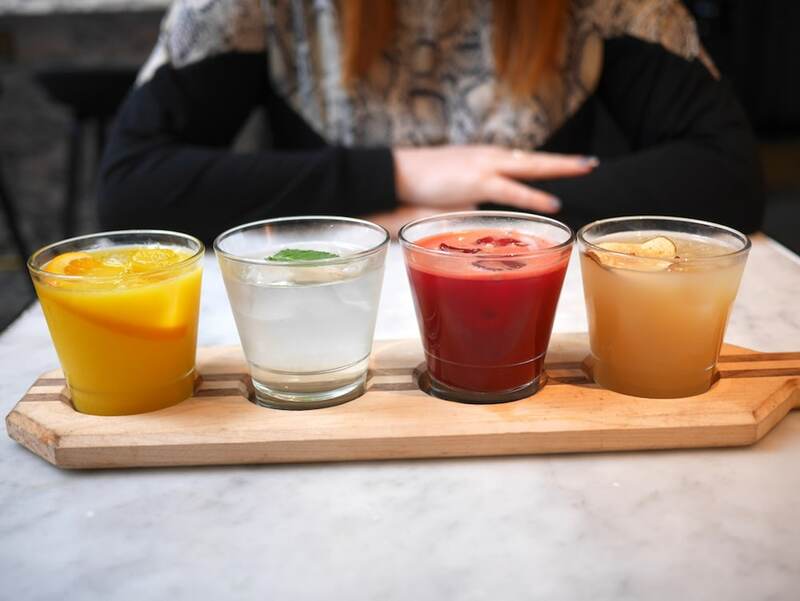 Ella went for a signature Redroaster Juice Flight, choosing cloudy apple juice, classic orange juice with bits, vibrant beetroot and carrot juice, and clear coconut water and fresh mint (my new favourite combo), from a choice of ten juices. To eat, I ordered the crab and avocado benedict. My thick slice of toast (sourced from Brighton’s Flour Pot bakery) was smothered in silky smooth avocado and loaded with herb-seasoned crab. Two oozing poached eggs were topped with just the right amount of hollandaise sauce, which wasn’t overly rich. A scattering of lemon dill added citrusy freshness, and the little blobs of yuzu curd were a revelation – like lemon curd but fresher, this Japanese flavour has a zesty tang. 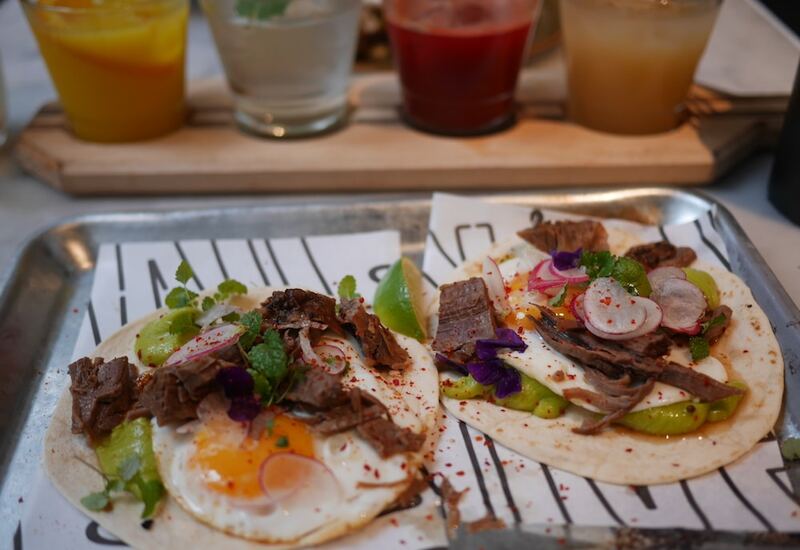 Ella chose the breakfast tacos – two soft tacos with braised beef short rib, poached eggs, guacamole, lime pickled onion, salsa verde and coriander, finished with a big squeeze of fresh lime. Stealing a few bites, I tasted beautifully tender beef that was richly seasoned and perfectly paired with vibrant, fresh ingredients. It reminded me of some of my favourite Thai and Mexican flavours rolled into one. By the time we’d finished our food it was fast-approaching coffee and cake time, so it seemed only right to stay a little longer. I ordered an almond and macadamia cappuccino, which was rich, mellow and naturally sweet. Continuing with her juice binge, Ella ordered a shot of Spark Plug (ginger, apple, lemon). 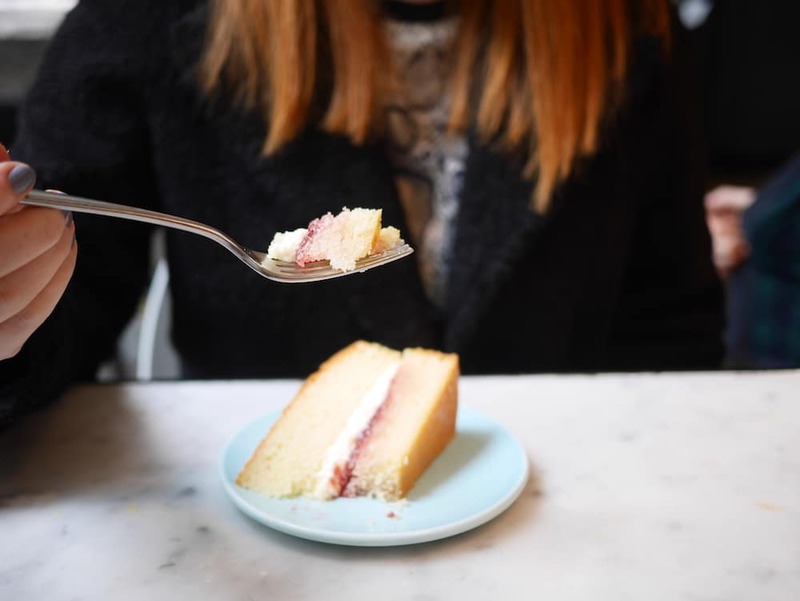 For cake, we shared a classic Victoria Sponge, which was light and moist with a delicious buttercream and strawberry jam filling. 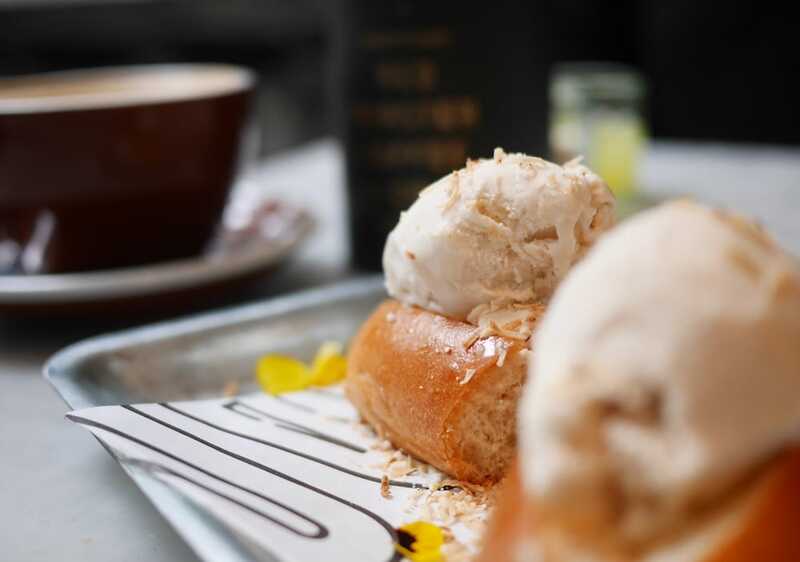 We also tried the homemade coconut ice-cream sandwich with peanut and toasted rice. By the time we left, every table was full and a queue of people was amassing by the door. Some were arriving for brunches and lunches, others were buying takeaway organic coffees or bags of Botanical Punk and Organic Glasshouse beans to grind and brew at home. 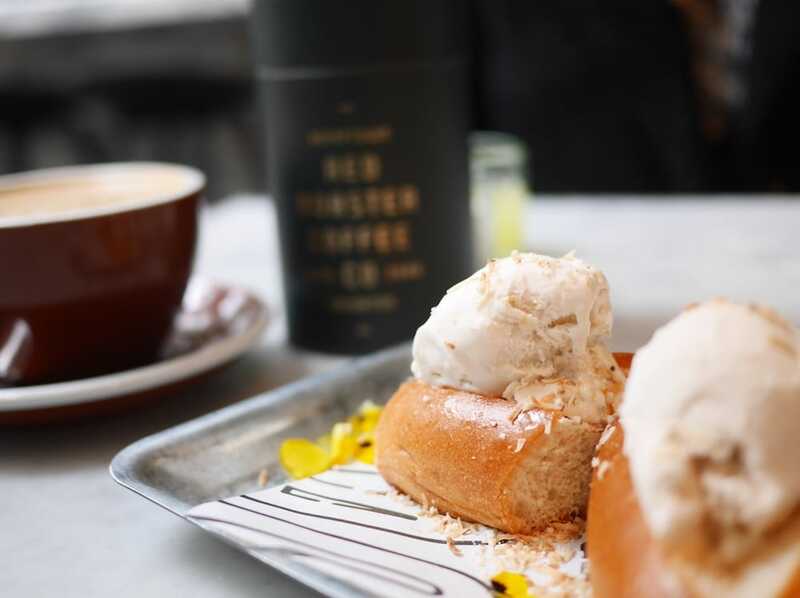 It’s inspiring how this Brighton institution has transformed from a local coffee house to a talked-about dining venue that was named as a go-to destination by the New York Times. 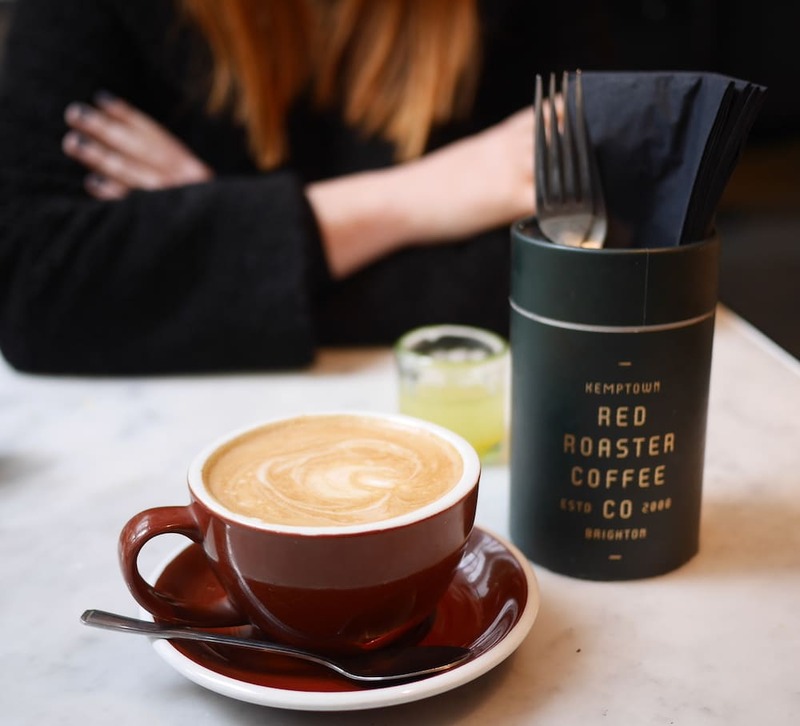 And, alongside the detox juices, wellness lattes and Thai-inspired cuisine, it still stays true to its roots with cracking coffee, crafted daily in Brighton’s oldest roaster, right here in Kemptown.